Heat oven to 350 degrees F. Grease a shallow baking pan; set aside. Use a fork to beat together eggs and milk in a large bowl. Stir in bread crumbs. Add ground ham, ground pork, onion, garlic, thyme or marjoram, 1/2 teaspoon mustard, and pepper to milk mixture. Stir until well mixed, using your hands to mix as necessary. Shape meat mixture into an 8x4-inch loaf; place in prepared baking pan. Meanwhile, cut up any large pieces of the peach preserves. Stir together peach preserves and the remaining 1/2 teaspoon dry mustard in a small saucepan. Heat and stir until preserves are melted. Spoon preserve mixture over meat loaf. Bake until internal temperature is 160 degrees F, about 10 minutes more. Let stand for 10 minutes. Carefully slice and serve. 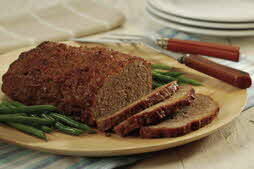 Bring the family together with this flavorful pork loaf. Round out the meal with garlic mashed potatoes, green beans and crusty bread.